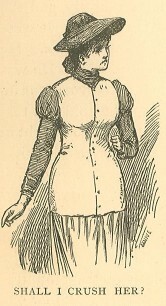 Returning to the United States in 1876, Champney published her first short stories in several popular magazines, including ‘’Harper’s.’’ Two years later, Champney finished the first of what would become a long series of “Three Vassar Girls” novels. Three Vassar Girls Abroad, illustrated throughout by Champ, recounts a lively tale of three Vassar students – Maud Van Vechten, the wealthy society girl; Barbara Atchison, the equally wealthy yet slightly eccentric West coaster; and Cecilia Boylston, the starving artist from Boston – on a leisurely romp across Europe. Over the next fourteen years, Champney produced ten more “Three Vassar Girls” volumes, situated everywhere from England to Switzerland to the Holy Land. Employing a “conversational” writing style, Champney managed both to entertain her young readers and to whet their intellectual appetites. In a typical “Three Vassar Girls” novel, the main characters tackle pertinent issues like bigotry and career development, while swooning over cute boys and attending garden parties. Critics met Champney’s novels with differing opinions. While The New York Times hailed the series for “combin[ing] instruction and entertainment” through “exciting, melodramatic or history-making adventures”, and Harper’s listed the novels among the “Best Books for Girls”, The Nation dubbed Three Vassar Girls Abroad “a diluted guide book, with a flimsy thread of rather silly personal narrative.” Likewise, in an 1882 Vassar Miscellany article, an anonymous reviewer lambasted Three Vassar Girls Abroad, calling the narrative “bald, disjointed, and inartistic” and lamenting, “It is not an enemy that reproached us, then we could have borne it!” Despite mixed reception among critics, the novels proved sprightly and fun, and Champney enjoyed considerable commercial success. She continued the series until 1892, at which point she had begun work on her acclaimed “Witch Winnie” series for children. During this period, Champney and her husband lived primarily in their Manhattan studio, where they partook freely of the city’s vibrant cultural scene, while collaborating extensively on Witch Winnie. 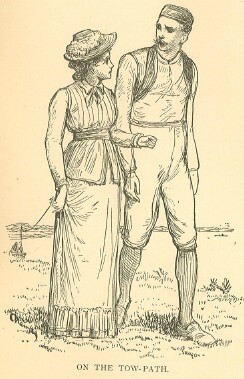 After her husband suffered a fatal fall down an elevator shaft in 1903, however, Champney focused on her “Romance” series for adult readers, which she continued until her death in 1921. By that time, she had written over one hundred books and articles. An imaginative and celebrated writer, Elizabeth Champney championed the benefits of higher education, and paved the way for the Vassar student abroad. “I think you are the luckiest girl in the world, Maud,” exclaimed Barbara Atchison; “here am I, with a lot of money, and nowhere to go. Father is stationed in the Black Hills this summer, and he doesn’t want me out there. He writes, ‘You have seen enough of Western society for the present. You are too old to be kept in the background as a child, and too young to do the honors of my house. If you mother had lived, home would have the best place for you; as it is, I wish you to profit by the civilizing influences of the East. You write enthusiastically of your New York friend; visit with her, this summer, and I will pay all expenses.’ There it is and my New York friend is going to Europe." Saint was Cecilia’s pet name. “I intended to go to Munich and continue my music, after we graduate,” she replied, “and I would enjoy this summer trip immensely, but I am afraid I can’t afford it." The girls laughed at this allusion to Saint’s waterproof, for it was a very characteristic bit of costume. Barbara declared that it completed the medievalism of her name, giving her the appearance of a nun, or a saint, in flowing gown of sackcloth. The Champneys’ son was named after Edouard Frère, the famous French painter under whom Champ studied. Their daughter, Maria Mitchell Champney, was named after Vassar astronomy professor Maria Mitchell, one of Elizabeth’s idols as an undergraduate. Alexander, Wendy. A Bio-Bibliography of E.W. Champney (1850-1922). SUNY Albany, 1974. “James Wells Champney” pamphlet. Vassar College Special Collections. Walsh, Chad. “A Reading Trip Abroad.” The New York Times. 1959. Harper’s advertisement. Vassar College Special Collections.